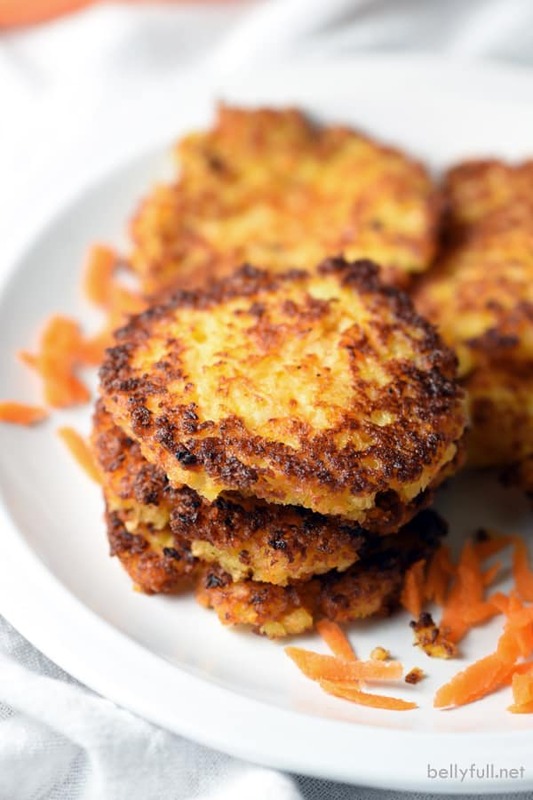 These Potato and Carrot Latkes are the classic potato latke – or potato pancake, if you prefer – with added carrots. Perfect for Jewish holidays and Thanksgiving! I am constantly surprised how angry people get over food. I see it every day on my Facebook page – readers all up in arms over certain ingredients together, or something being unhealthy, or the name of a recipe. The NAME of a recipe. It’s quite silly if you ask me. Don’t we have more important things to worry about? But in all fairness, if your great great grandmother and great grandmother and grandmother and mother all called your favorite childhood dish smothered burritos, then you feel compelled to correct someone when they call them enchiladas. Ok. Fine. I sort of get it. I guess I feel that way about latkes – or potato pancakes, if you prefer. When people prepare them and they resemble hash browns, I cringe a little. Not because those aren’t delicious! But, let’s be clear. Those aren’t latkes. Traditional latkes are pureed and smooth, not shredded. 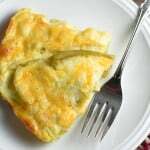 They have a crispy outer shell and slightly softer interior. There’s really nothing quite like them. Have you ever had one? They’re traditionally made for Passover, Hanukkah, and Rosh Hashanah (which is the Jewish New Year and begins at sundown this Wednesday.) 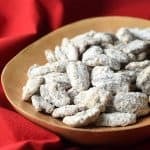 We only make them for those holidays because they’re fried and really a treat. Sometimes I add zucchini, or in this case carrots, for some sweetness. And to fool myself into thinking they’re good for us. HA. You certainly don’t need to be Jewish to enjoy these, though – they’d be perfect for Thanksgiving, too. 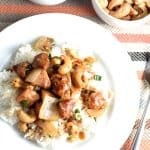 Their deliciousness is truly universal! 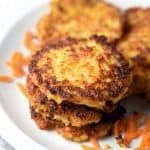 These Potato and Carrot Latkes are the classic potato latke - or potato pancake, if you prefer - with added carrots. 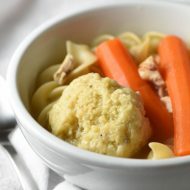 Perfect for Jewish holidays and Thanksgiving! Preheat oven to 300 degrees F. Line a large baking sheet with a double layer of paper towels. In the bowl of a food processor fitted with a serrated s-blade, combine the onion and eggs; puree until smooth and fluffy. Add the potato and carrot. Using on-off pulses, process the mixture until pureed, but still retaining a little texture. Add the salt, pepper, and flour and briefly process to combine – do not over process. Transfer mixture to a colander and drain well. Pour a solid layer of oil in the bottom of a large nonstick pan over medium-high heat. When the oil is hot, working in batches, spoon rounded tablespoons of the mixture into the pan (make sure they don’t touch each other.) Flatten slightly with the back of a spoon – they should be about 3 inches in diameter. Transfer the latkes to the lined baking sheet to drain and place in the oven until all are cooked. 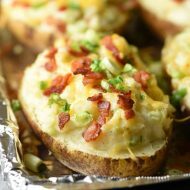 Serve immediately on their own or with some sour cream or applesauce. 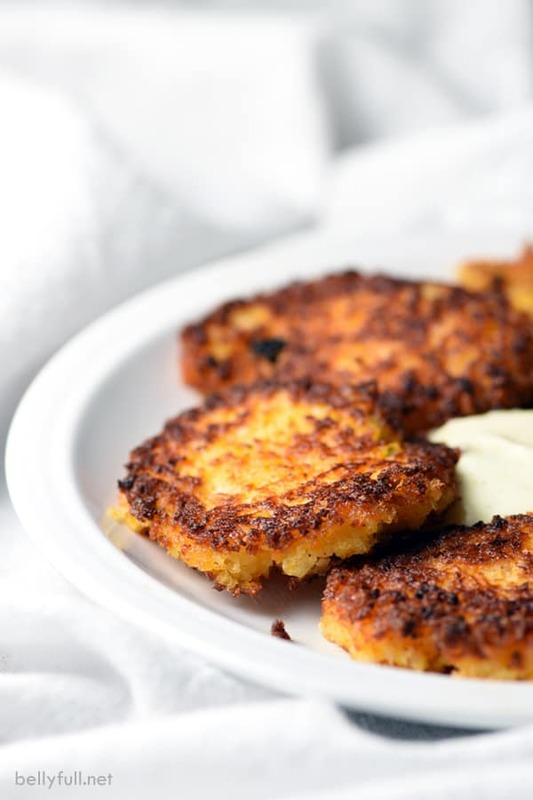 Although best eaten right away, fried latkes can be kept at room temperature for up to 3 hours. 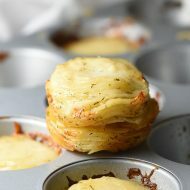 Reheat them on a baking sheet in a 375° oven for about 5 minutes, or until warmed through and crisp. 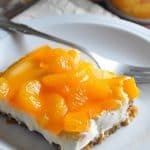 OTHER RECIPES YOU MIGHT ENJOY! These look beautiful. I’ll have to give them a try. I don’t even think I’ve ever had a real latke before Amy, shame face! I need to try these out!! I really want to make these. I actually use that recipe from Krysta from so many years ago – which has apple and onion in it, so using carrot instead of apple totally makes sense to me. Just yum. As for style… before I had a food processor, I just made these like hash browns. And I knew you hated it. :P But I can make real latkes these days! Hi Amy! I hear you about people complaining about one thing or another! I have discovered in my 62 years that some people just aren’t happy unless they can complain about something. For me, I am happy just to wake up every morning! I will try the potato/carrot latkes as they look delicious! No doubt, Debra! Those people are exhausting. I’m so glad you stopped by, thank you!